Sony's description of the new DSLR A900: "The new standard in digital photography has arrived with the Sony α (alpha) DSLR-A900. Packed with features, this flagship DSLR is the first α (alpha) to incorporate a 35mm full frame image sensor and 24.6-megapixel resolution. It also incorporates the world's first body-integrated, full-size SteadyShot INSIDE™ image stabilization technology.You'll also experience a larger capture area, improved wide-angle performance and tighter depth of field control with the new full frame Exmor™ CMOS image sensor. Equipped with Dual BIONZ™ imaging processors, the alpha A900 delivers continuous shooting up to 5 fps with superb image quality and ultra-low noise. The A900 also offers a large, ultra-bright glass pentaprism viewfinder with 100 percent coverage, a 3.0-inch Xtra Fine LCD™ display and HDMI™ output with PhotoTV HD compatibility." 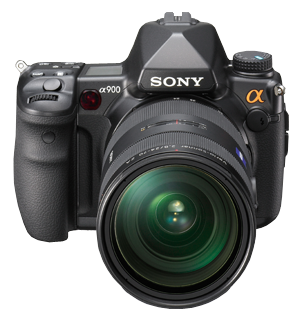 The A900 features a 35mm full frame Exmor™ CMOS image sensor that is approximately 2.35x larger than the APS-C sized sensors found in many DSLR cameras. The result is a larger capture area, improved wide angle performance, and tighter depth of field control. In addition, its 24.6MP resolution maximizes the resolving power of your existing lenses and delivers sharper, higher contrast photos. Building on years of expertise, Sony has developed the world’s first body-integrated image stabilization solution for a full frame DSLR1. The SteadyShot INSIDE™ in-camera image stabilizer actually shifts the image sensor to compensate for camera shake without sacrificing image quality. The compensation effect is equal to as many as four shutter speed steps, giving you more creative freedom when shooting in low light. And, because it is integrated into the camera body, SteadyShot INSIDE technology works with all compatible ? (alpha)system lenses. The A900 harnesses the power of Dual BIONZ™ image processing engines to deliver true-to-life images with ultra-low noise and continuous shooting at up to 5 fps. Review your images in stunning detail on the 3.0” Xtra Fine LCD™2 display (921k pixels). With photo-quality resolution of 270ppi(pixels per inch), you can identify any necessary focus or exposure corrections at the time of capture, rather than discovering them when you transfer your images to your PC. The A900 provides direct HDMI™ output to your BRAVIA® HDTV and other compatible HDTV screens, so you can view and share photos in breathtaking clarity and detail3. Additionally, PhotoTV HD capable BRAVIA® HDTVs will automatically optimize display settings, such as sharpness, gradation, and color to display your images in a way that more closely matches the natural look of printed photographs3. The A900 features an impressive design befitting a premium flagship model. The simple form eschews ornamentation and exudes competence, while the iconic pentaprism design element conveys superior optical performance. The A900 also incorporates a distinctive cinnabar-colored ring circling the lens mount – a design element shared across every ? (alpha) DSLR camera. The body of the A900 is entirely covered in a die-cast magnesium alloy shell, providing a rugged feel and surprisingly light weight. A supplied InfoLITHIUM® lithium-ion battery provides long-lasting performance, allowing you to capture approximately 880 images on a single charge7. The A900 features a dual card slots and accepts both CompactFlash® and Memory Stick Duo™ Media (sold separately). Analog-to-digital signal conversion is performed by the full frame Exmor™ CMOS image sensor. In addition to digitizing analog signals, the full frame Exmor™ CMOS image sensor also performs both analog and digital noise reduction. This on-chip dual noise reduction process aids in the high speed transfer of noiseless digital signals. Updated Image Data Converter SR3 software4 improves your workflow with faster RAW file processing and improved image correction. In addition to full frame image capture, the A900 can also crop images to the APS-C size format, allowing the use of lenses designed specifically for APS-C sized image sensors5. The Image Data Lightbox software4 included with your ? (alpha) DSLR helps you browse, rate, and compare your images, making it easier to select your favorites for further processing. Sony® Picture Motion Browser (PMB) software4 provides a simple and intuitive way to sort and archive your image collection, as well as perform common editing operations and output to data disc or the Web. SONY DSLR A900 is technically a good featured one . The clarity picture can capture using this camera. This make a new face in photo quality of a digital. We can see it in Camera Effective Pixels: 12.1 Mega Pixels. I done my dissertation writing service UK using this camera. Loved it. Do not forget to read Sad Hindi Shayari and Love Shayari in Hindi. Banyak website agen casino yang menawarkan berbagai permainan judi online casino seperti judi poker, kasino dan juga sbobet. Status biasa di sebagian besar situs-situs ini memungkinkan Anda untuk membuat taruhan dan mengamati statistik dasar dan peluang yang ditawarkan untuk setiap acara tertentu. Ini adalah keterampilan yang harus Anda kuasai agar Anda memiliki sukses jangka panjang dalam taruhan olahraga di idn poker, selama Anda meluangkan waktu dan upaya untuk membangun wawasan handicap yang telah menunjukkan rekor kemenangan yang konsisten. Very useful advice in this specific post! Oahu is the net worth gucci mane little changes which make net worth eminem the largest changes. net beyonce Thanks for discussing! net adam sandler The content net jerry seinfeld you have shared here very awesome. I like and valued your work. I read deeply your net kevin hart report, the items you've mentioned in this information are net triple h helpful net john cena I've never had a picked radish or green vegetable that I am conscious of - but following seeing these net david bowiebeautiful photographs, net julia louis dreyfus I know I want to!